You may never acquire all of Superman’s powers—and really, freezing breath probably isn’t all that great—but Swiss pilot and daredevil Yyves “Jetman” Rossy keeps showing that personal flight is more than an idle daydream. Yesterday the aviation innovator released another stunning video of himself soaring through the sky above Dubai while strapped to a jetpack of his own design. This wasn’t the 55-year-old Rossy’s first foray into the spectacular. In 2006, he made his first flight using his jet-powered wing, a contraption that consists of a 7-foot wing and four kerosene jets that allow him to reach speeds of 125 mph. 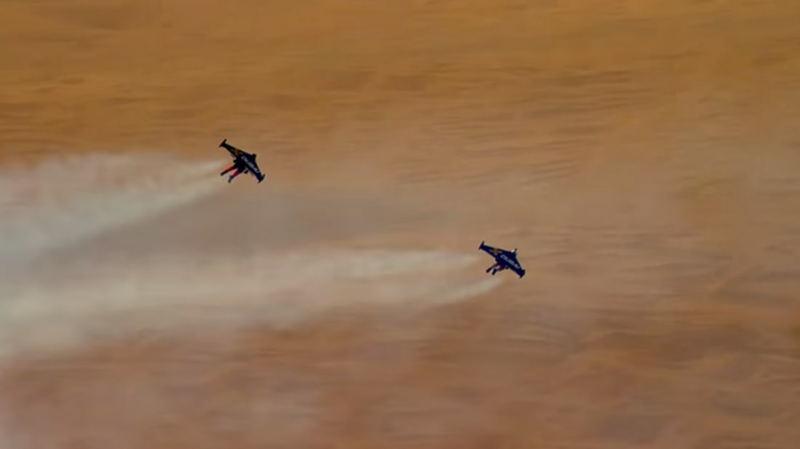 Last December he flew in formation with a plane over Dubai, which was dazzling enough on its own. Yesterday’s video upped the ante with an even cooler new twist. Like any good superhero, Rossy now has a sidekick: Vince Reffet, a renowned skydiver and BASE jumper whose previous airborne exploits have included a BASE jump off the Burj Khalifa. From the moment they drop from a helicopter and take flight, this 12-minute video of their airborne exploits is sure to make your jaw drop.